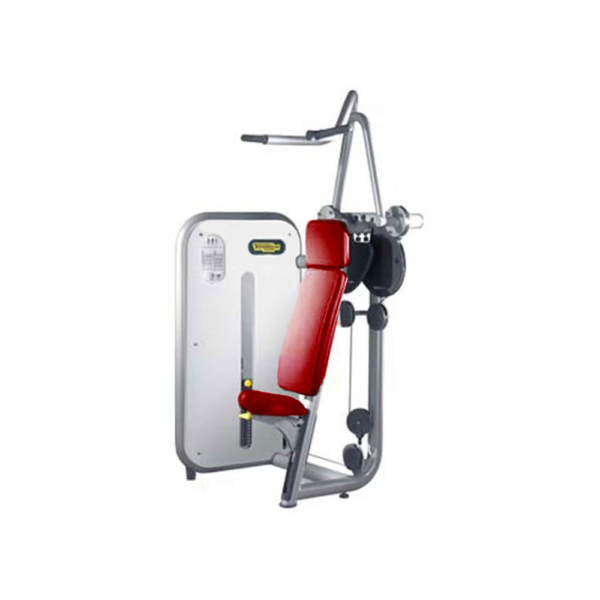 The Vertical Traction is part of Technogym’s extremely popular Element line. The machine comes with Biomotion, which replicates the body’s natural movement through the selected range of motion. Resistance remains steady and delivers exceptionally fluid movements which greatly enhance the user experience. Physiocam is yet another program where variable resistance is delivered to accommodate the specific strength curve of the targeted muscle group. Users enjoy the benefit of consistent resistance throughout their workout. The Vertical Traction from Technogym features an ergonomic seat and backrest which assist the user in maintaining the correct position during the workout. This feature also assists in supporting the user’s spinal column. Outward facing seated position with back pad helps encourage correct posture and movement. The arc of movement is designed to provide a greater range of motion for the lat muscles. The plane of movement is slightly forward of the shoulders to provide a comfortable path of motion for the user. The two arms are independent resulting in balance strength development. Vertical Traction for sale, feel free to enquire above.